Alexander Schneider and Christina Rosso-Schneider, owners of A Novel Idea on Passyunk. The number of bookstores in South Philadelphia is small, but this weekend the neighborhood will get a new shop with the opening of A Novel Idea on Passyunk. 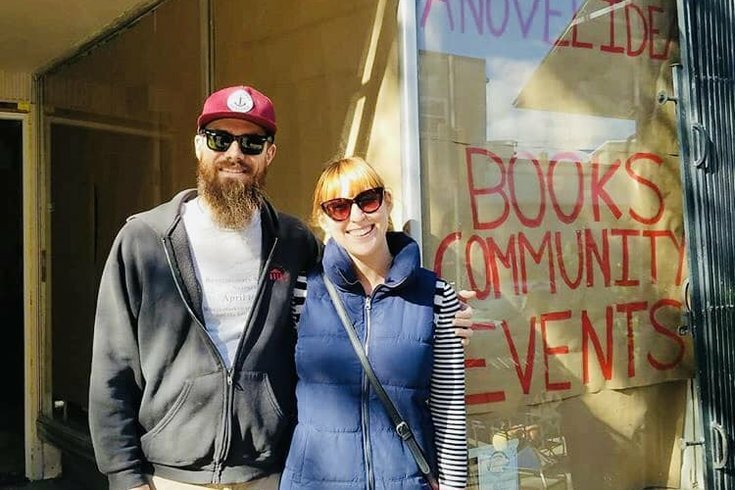 The shop, opened by a newly married Tinder couple, will sit at 1726 E. Passyunk Ave. (where gift shop Knack used to be), and host community events, as well as sell titles written by Philadelphia-area writers and published by Philadelphia printers. The inventory will also include a mix of both used and new books, the couple told South Philly Review. The project has been an ongoing one for owners Christina Ross-Schneider and Alexander Schneider, who will open A Novel Idea's doors for the first time during the soft opening on Saturday, Dec. 1. The store will be open from 11 a.m. to 7 p.m., offering fresh baked goods, as well as happy hour drinks and snacks starting at 5 p.m. In the new year, A Novel Idea plans to launch a series of writing workshops, author visits, and other community activities for both children and adults. In collaboration with rising Philadelphia literary collective Blue Stoop, three workshops will launch at the store in late January. The workshops include food writing, contemporary poetry, and fiction. Stay posted on other updates from A Novel Idea on Facebook.